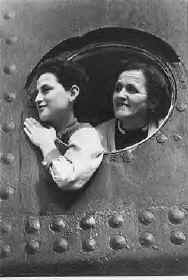 Jewish refugees aboard SS St. Louis. Many people have come to think of the Holocaust as a “Jewish thing,” and therefore not applying to them. Some students turn off and some actively resist and espouse the position of the deniers. This is an attempt to make the Holocaust relate to a wider group of students, including Hispanics and Blacks, who previously were unaware of this connection. Moreover, when discussing the history of the Second World War, the relative positions of the European and Asian countries is fairly straight-forward, as is North America and Australia. African countries at that time was primarily colonial, and so went with their colonial masters’ policies. The only group of independent nations who were not actively involved in the war as combatants or colonies were the Latin American nations in Central and South America, as well as the Caribbean Basin. This project allows students to identify the stances adopted by these sovereign nations in response to the world war. The project also helps bring the Holocaust into an environment where it can be curricularly justified in United States history classes. Not only did these nations have close dealings with the U.S., in many cases their foreign policies were directed by their attitude towards the U.S., either positive or negative. Students were to engage in individual and group research to fulfill their assignments. They were to use multi-archival techniques and innovative methods of obtaining information that may not be readily available through the most conventional sources. Students were encouraged to interview Holocaust survivors and foreign consular personnel, use the Internet, and to use primary sources, such as the magazines, newspapers, and government documents of that time. Students were to understand that the terms “victim,” “ perpetrator,” and “bystander” did not apply just to individuals, but to governments and nations as well. They were upset to learn of the international reaction to the Holocaust, but were particularly struck by the deceit and indifference show by the United States. Students were motivated to see the string of international conferences, in this hemisphere and elsewhere, as futile, self-serving exercises, and that humanitarian considerations were only some of many factors which created policy, and often the least considered. Following extensive discussion of the origins of the Holocaust and America’s response, including viewing the film, America and the Holocaust: Deceit and Indifference, I wanted a stronger connection to my student body. My classes are extremely heterogeneous ethnically, and in South Florida I wanted a Hispanic connection. In choosing Latin American, I was also able to incorporate the response of the first independent Black nation Haiti, and the Afro-American influence in other nations as well. For a scenario, I had the students see me as the American Secretary of State. It was 1945 and the United Nations was being officially organized. One of the requirements to join was to have declared war against the Axis nations. As Secretary of State, I required a briefing on the wartime activities of the Latin American countries to help me decide if the United States would oppose any of them for entry into the United Nations. The students became State Department employees and were to prepare a thorough written report and an oral presentation of not longer than five minutes. Students picked a number and were told which countries they were assigned. Students were encouraged to do initial research on the formation of the United Nations. Then, trying to look their topics up directly in the school library, they became frustrated, as few books were specifically on their topics. I directed them to the general works on their countries, the major personalities involved, the various conferences, and other works that peripherally dealt with the subject. They found the community college library far too limited and began using the public libraries and then area college and university libraries. Interlibrary loan and the use of the OCLC, the On-line Computer Library Catalog proved valuable. Internet research was done using USHMM online resources. At the Holocaust Awareness Days, organized and sponsored by the Holocaust Documentation and Education Center, students were able to speak with survivors to further their own knowledge and get a different perspective on their topics. The students became aware that although survivors are primary sources, they are only human and have fallible memories. Sometimes the survivors remembered events that they had heard about but had not participated in, such as the S.S. St. Louis, differently than the students’ research had revealed. Faced with this conundrum, the students were encouraged to use the perceptions they were acquiring as historians to weigh the evidence and make their own decisions as to accuracy and factualness. When the reports came in and the presentations were made, the students were given grades on both, with the focus being on the factual content. The students uniformly agreed that the experience had been profitable and enlightening. They had learned things they had never suspected, some about their native countries. The assignment was done by 11th graders as a part of the U.S. history class. Seniors wanted to know why they had not been allowed to do this the previous year. A select bibliography appears below. If feasible, students can also contact the consulates of the various nations studied in this lesson. Of incalculable value were the proceedings of an international conference held at the United States Holocaust Memorial Museum on 20 October 1996, “War Criminals and Nazism in Latin America: 50 Years Later.” This publication is available from the Museum. Atkins, G. Pope. Latin America in the International Political System. New York: The Free Press, 1977. Avriel, Ehud. Open the Gates! New York: Atheneum, 1975. Bailey, Norman A. Latin America in World Politics. New York: Walker and Co., 1967. Baptiste, Fitzroy Andre. War, Cooperation, and Conflict: The European Possessions in the Caribbean, 1934-1945. New York: Greenwood Press, 1988. Beller, Jacob. Jews in Latin America. New York: Jonathan-David, 1967. Bethel, Paul D. The Losers. New York: Arlington House, 1969. Bethell, Leslie, ed., The Cambridge History of Latin America. New York: Cambridge University Press, 1980. Biesanz, Richard. The Costa Ricans. Englewood Cliffs, NJ: Prentice Hall, 1982. Buckley, Tom. Violent Neighbors: El Salvador, Central America, and the United States. New York: Times Books, 1984. De Galindez, Jesus. The Era of Trujillo. Arizona: University of Arizona Press, 1973. Dear, I.C.B., and M.R.D. Foot. The Oxford Companion to World War II. New York: Oxford University Press, 1995. Dubois, Jules. Danger over Panama. New York: Bobbs-Merrill, 1964. Elkin, Judith Laikin. Jews of the Latin American Republics. Chapel Hill: University of North Carolina Press, 1980. Elkin, Judith Laikin and Gilbert W. Merkx, eds. The Jewish Presence in Latin America. Boston: Allen and Unwin, 1987. Encyclopedia Judaica. Jerusalem, Israel: Keter Publishing, 1972. Farrago, Ladislas. Aftermath: Martin Bormann and the Fourth Reich. New York: Simon and Schuster, 1974. Feingold, Henry L. Bearing Witness. New York: Syracuse University Press, 1995. Feingold, Henry L. The Politics of Rescue: The Roosevelt Administration and the Holocaust, 1938-1945. New Brunswick, NJ: Rutgers University Press, 1970. Foreign Relations of the United States. Diplomatic Papers. (1933 - 1946) The American Republics. Washington, D.C.: United States Government Printing Office, Department of State, various years. Friedman, Saul S. No Haven for the Oppressed. Detroit: Wayne State University Press, 1973. Herring, Hubert. A History of Latin America: From the Beginning to the Present. New York: Alfred A. Knopf, 1972. Krauss, Clifford. Inside Central America: Its People, Politics, and History. New York: Summit Books, 1991. Lesser, Jeffrey. Welcoming the Undesirables: Brazil and the Jewish Question. Berkeley, CA: University of California Press, 1995. Levine, Robert M. Tropical Diaspora: The Jewish Experience in Cuba. Florida: University of Florida Press, 1993. Lieuwen, Edwin. Arms and Politics in Latin America. New York: Frederick A. Praeger, 1961. Martin, Michael R. and Gabriel H. Lovett. Encyclopedia of Latin American History. New York: Bobbs-Merrill, 1968. Morse, Arthur D. While Six Million Died: A Chronicle of American Apathy. New York: Random House, 1967. New York Times, 1933 to 1947. Parrish, Thomas, ed. The Simon and Schuster Encyclopedia of World War II. New York: Cord Communications, 1978. Paz, Alberto A. Conil and Gustavo E. Ferrari. Argentina’s Foreign Policy: 1930-1962. Notre Dame, IN: University of Notre Dame Press, 1966. Perkins, Dexter. The United States and the Caribbean. Cambridge: Harvard University Press, 1947. Perl, William R. The Holocaust Conspiracy. New York: Shapolsky Publishers, 1989. Pope, Stephen, James Taylor, and Elizabeth-Anne Wheale. A Dictionary of the Second World War. New York: Peter Bedrick Books, 1989. Sheinin, David, et al., eds. The Jewish Diaspora in Latin America. New York: Garland, 1996. Simon, Maron J. The Panama Affair. New York: Charles Scribner’s Sons, 1971. Weyman, David S., ed. The World Reacts to the Holocaust. Baltimore: Johns Hopkins University Press, 1996. Zea, Leopoldo. Latin America and the World. Norman, OK: University of Oklahoma Press, 1969. This project can be replicated anywhere. The resources are available through the Internet and interlibrary loan if the materials are not to be found locally. Consulates and embassies are scattered across the country, and at worst are available through a long-distance call, although the required information could most easily be obtained by mail or e-mail. This lesson should appeal to almost every ethnicity in the classroom, as every one of these nations dealt with Native American populations, Asians, and Blacks as well as Jews. It deals with institutionalized prejudice both with and without the sanction of government, church, or both. Although it was designed as an entry point for a United States history class into the Holocaust, it could be used as easily for a world history class. It could also be used in conjunction with foreign language classes to translate documents from Spanish, German, and Portuguese. While this project was completed using academically-advanced eleventh graders, it is not beyond the capacity of any high school junior, and should be adaptable to lower grades with appropriate guidance and acquisition of materials. This can be done either by purchasing works in print or, more economical and more effective for out-of-print works, by the teacher using interlibrary loan and getting the research materials for the duration of the project.